John had been living quite happily, working, coping and enjoying life when for no apparent reason; he started having mental health difficulties resulting in a breakdown. It was during this time that john went to live in a tent in the woods. John found that he could not be around people and wanted just to be by himself away from everyone and everything. One night, 2 years down the line and recovering from his breakdown, John's tent was raided by the police looking for someone - not John, but during this meeting the police told John about The Salvation Army KiP Project, and made him promise to go there. John went to The Salvation Army KiP Project and was offered a room in shared accommodation at one of the properties that Maninplace managed, but John could not cope with that. Fortunately for John, one of the Maninplace self contained units at Revlo Court became vacant and John moved in. John has been accommodated with Maninplace for 11 months, and while with there, has accumulated items of furniture ready for a more permanent home. While John was at Revlo Court he was able to socialise, mix and interact with people again. 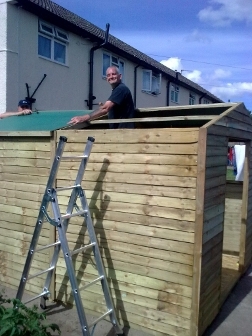 In return John has given lots back to the Maninplace project by way of using his many skills for use at our properties, including painting, tiling, gardening, helping to erect a shed and many small but vital DIY jobs. John summed up what Maninplace meant to him. "The main thing that Maninplace gives you back is yourself respect" and added that "here at Revlo Court if you have any sort of problems no matter what it is there are people you can talk to who put themselves out to help you to sort it out". Today John has his own flat and is in full time employment.